Today we are featuring Artist Pewara Nicropithak and her mini me, “Innie.” We love her drawings and the personas they have taken on. They are filled with positivity and definitely put a smile on your face if you’re having “one of those days.” Read on to learn more about Pewara and how Innie came to be. : What made you start Mini Store by Innie? : Self interest with a passion in drawing and fashion. : Innie is a character of a cheer, optimism and style, represented by sweet graphic quality. : What would you like the character of “Innie” to represent to those viewing your work? 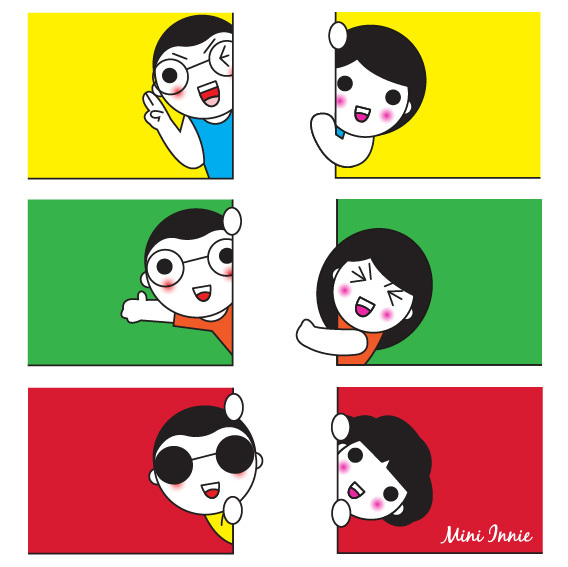 : Innie is the character that represents myself in mini size. I’m happy to share anyone who views my drawing feeling pretty, stress-free, fun and positive thinking. : Describe your career path. Have you always been interested in pursuing art? : My passions have always been drawing and fashion. After 10 years as a marketer in the cosmetics and fashion business, I have found drawing is my real joy and became a freelance illustrator. : Describe your process for making your “Innie” art. : Getting inspiration and taking a quick sketch on my tablet, then finish my drawing with computer graphics. : Fashion, Japanese Character Design, Family, Friends, Favourite Quotes, Thai Culture, Travel and Food. : Who has influenced your work or who you are today? : My mom and hubby. : Where is your go-to place to create work? Describe your setting when you work. : My home studio. Usually I start drawing in the early morning. Looking at flowers, trees and birds in my garden inspires fresh ideas. Sometimes I enjoy to do it and forget to see time, finally, I end up my work late at night. : Name some of your favorite things. Do some of your own likes translate into your work? : Yes, I gain idea inspiration from looking at fashion and reading runway trends, Thai culture and Japanese character style. Because of all these I can create Innie‘s character as it is today. : Choose to do what you love, and you will never have to work a day in your life.